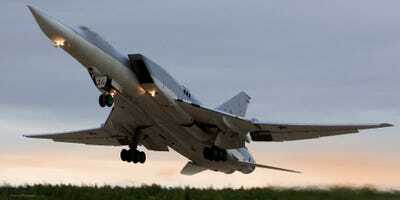 Russia will roll out an upgrade to its Tu-22M supersonic, nuclear-capable bomber on August 16. The upgrade modernizes the avionics and communications, but its integration with anti-ship missiles makes it a huge threat to US Navy aircraft carrier strike groups. Both Russia and China have very long range, very fast missiles that could possibly sink a carrier. The US is working on a new unmanned tanker jet for aircraft carriers to extend its range and fight back the competition. Russia’s long-awaited upgrade to the Tupolev Tu-22M, the Tu-22M3M, will roll out on August 16, and bring with it a missile that’s a nightmare for the US Navy to defend against, The Diplomat reports. The Tu-22M, an airframe that first flew in 1969, features a variable wing and a massive payload at around 2.4 tons, rivaling the B-1B Lancer, the US’s only supersonic bomber. The upgraded Tu-22M3M focuses on modernising the avionics, communications, and controls on the Cold War era bomber, according to the report. But the Tu-22M3M’s integration with some of Russia’s deadlier missiles, and role as a nuclear-capable maritime strike jet pose a serious challenge. Not only can the Tu-22M carry nuclear weapons, it has some formidable anti-ship weapons and even an air-launched ballistic missile. The KH-32, the Diplomat reported, has been purpose-built to take on US Navy aircraft carrier strike groups, the most expensive and powerful ships in the world. With a claimed range of 620 miles and a flight pattern that soars it up into the stratosphere before diving down low to approach a target at speeds up to four times the speed of sound, the KH-32 takes advantage of both high and low altitudes. This varied flight path and incredible speed present a very hard target for US Navy missile defences to intercept, and the missile’s claimed range means Russian Tu-22M3M pilot can fire from a safe distance outside the maximum range of US Navy F/A-18 Super Hornets, which max out at around 550 miles. Russia has developed over the last few decades long range missiles meant to target US aircraft carriers as a means of neutralising the US’s massive advantage in carriers. Russia’s only aircraft carrier, the Admiral Kuznetsov, is an outdated ship with a host of mechanical issues and will be offline for years during an overhaul. China, the US’s other great power competitor, which has in many ways eclipsed Russia, has also worked on a gang of new missiles that combine nontraditional flight paths with supersonic bursts of speed to get through US defences. US carrier strike groups rely on guided missile destroyers and cruisers to defend the capital ship, the carrier, from incoming enemy missiles. Currently, the US hopes to overcome the Russian and Chinese missile gap with an unmanned refuelling tanker aboard aircraft carriers that could extend the range of the jet fighters on deck.